The success of any website entirely depends on how its web design is. Whether the designers have taken utmost care or not while developing it. Your nicely-designed site which includes usability and utility, determines the success, and not the visual design. Since your site is the face of your business and most potential customers will visit your site before they ever look in on your store, it becomes inevitable to get your website designed cautiously. Lacking in any aspect could end up demolishing your brand impression. Web page design is more critical for conversions than you think. Despite using a great conversion boosting tactic, you may not do much if it looks poor in quality. In fact, website design doesn’t necessarily mean how it looks like and feels like, but is how it works. Even a simple looking website with exceptional usability and well-structured, typically performs amazingly on Google. User views of such websites are also higher than those with poor user experience. The performance entirely depends on the effectiveness of the website. So, how to design a good website? Good website design needs a wide range of professionals having expertise in different areas. Their collective efforts need to put in when there is a critical decision to take place. 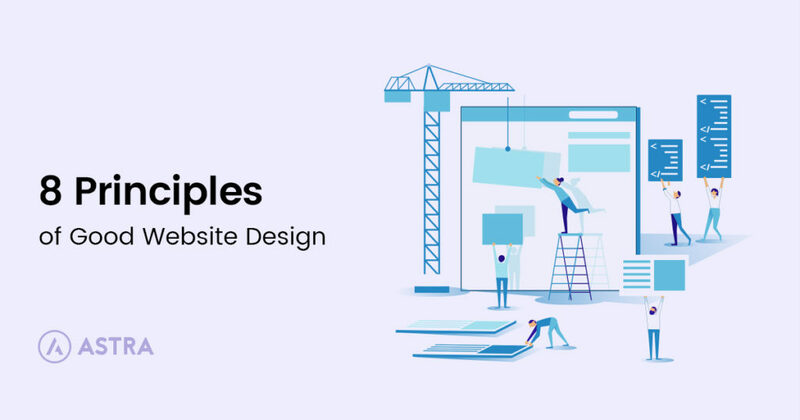 Here in this article, we’ll outline the 8 essential principles of good website design which must be pondered while developing a website. These design principles will definitely help web designers to develop awe-inspiring designs and to enhance the usability of a website. Over-designed website may not work. Putting too many elements on the page may lead to distract visitors from the main purpose of your website. Simplicity always works in an effective web page design. Clean and fresh design of your website not only makes the website appealing, but also help user to navigate from one page to another seamlessly. Loading a website having design features which do not serve the purpose may be frustrating. Keep your design as simple as possible so that the visitors can feel it easy-to-use and can find their ways easily. Consistency in website design matter a lot. Give your attention to match design elements throughout each of the pages. It can be understood that your fonts, sizes, headings, sub-headings, and button styles must be the same throughout the website. Plan everything in advance. Finalize the fonts and the right colors for your texts, buttons etc, and stick to them throughout the development. CSS (Cascading Style Sheets) would come in handy to keep the complete information about design styles and elements. No matter how good your design is text still rules the website as it provides users the desired information. Since search engine crawlers are very much familiar with this data, it becomes an integral part of SEO activities. You should keep your typography visually appealing and readable for visitors, along with tricky use of keywords, meta-data, and other SEO-sensitive elements. Consider using fonts that are easier to read. The modern sans-serif fonts as Arial, Helvetica etc. can be used for the body texts. Make proper combinations of typefaces for each and every design elements such as headlines, body texts, buttons etc. Keeping in mind the ever-growing usage of smartphones, tablets and phablets, web design must be effective for various screens. If your website design doesn’t support all screen sizes, chance is that you’ll lose the battle to your competitors. There are a number of web design studios or service points from where you can turn your desktop design into a responsive and adaptive one for all screen sizes. A perfect color combination attracts users while a poor combination can lead to distraction. This necessitates you to pick a perfect color palette for your website which can create a pleasing atmosphere, thus leaving a good impact on visitors. Enhance users experience by selecting complementary color palette to give a balanced-look to your website design. Remember to white space use as it avoids your website from visual clutter and mess. Also avoid using too many colors. 3 or 4 tones for the whole websites are ample to give appealing and clear design. Study shows that visitors stay more time on the websites having easy navigation. For effective navigation, you may consider creating a logical page hierarchy, using bread scrums, and designing clickable buttons. You should follow the “three-click-rule” so that visitors can get the required information within three clicks. The ultimate purpose of the visitors is to get information, and if your website is able to communicate your visitors efficiently, most probably they would spend more time on your website. Tricks that may work to establish effortless communication with the visitors are – organizing information by making good use of headlines and sub-headlines, cutting the waffle, and using bullet points, rather than long gusty sentences. Keeping the aforementioned principles of good website design, you can easily develop an aesthetic and functional website. Without this base, it would be difficult to travel a long path. Only with a clean and user-friendly design, you can think to succeed. This is a guest article contributed by Alice Jackson. She is a business consultant, blogger, social media enthusiast, online market analyst, amateur designer and an avid author at Designhill. She has written on several topics including social media marketing, SEO, content marketing, startup strategies and e-commerce. When she’s not writing, she loves spending her time reading romantic novels, creating new t-shirt designs. Nice article. Was difficult to acces to it by Google. Just browsing in 5th Google page and find it hehe. This actions should be done step by step, taking at least between one-three months for each, to ensure the success of the entire project. Good article!! I think that one of the most important thing for a good SEO job is the design of the pages, seo it’s not only technical or content issues. I think numbers seven and eight can be condensed into one point. Hey nice article, I really like that you give emphasis to simple design because simple designs are easy to load and hava a huge impact on the site ranking. Wow! I really enjoyed reading this. All know that business website is the internet face of your company, so it’s of the utmost importance to create a great website design that will appeal to website visitors.